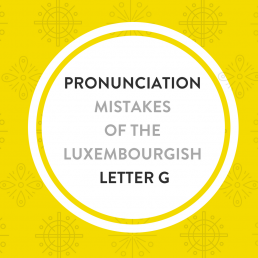 Ten common Luxembourgish mistakes with prepositions! Prepositions can be very challenging, even for advanced Luxembourgish learners! Today I’ll teach you 10 of the most common mistakes students make with prepositions and how to fix them. Vu wou kënns du? Where do you come from? Ech kommen aus Italien. I come from Italy. Ech kommen aus Ungarn vu(n) Budapest. I come from Hungary from Budapest. Ech kommen aus der Belsch vun Arel. I come from Belgium from Arlon. Wou wunnt Dir? Where do you live? Ech wunnen a(n) Frankräich. I live in France. Exception: Ech wunnen zu Lëtzebuerg. I live in Luxembourg. Wou schafft Dir? Where do you work? Ech schaffen zu Mamer. I work in Mamer. Position / Location: Use the the preposition zu + city when there is no motion. Exception: Ech schaffen an der Stad (Luxembourg city). I work in town. Wouhi(n) gitt dir de(n) Weekend? Where are you going on the weekend? Mir ginn op London. We are going to London. Destination / Movement: Use the the preposition op + city when you go there. Exception: Ech ginn an d’Stad. I go to Luxembourg city. Wat maacht dir de(n) Weekend? What are you doing this weekend? Am Weekend ginn ech mat der Famill spadséieren. De(n) Weekend ginn ech mat der Famill spadséieren. This weekend I’m going for a walk with my family . Use the definite masc. article de(n) before weekend and not an dem or am. Wéini schaffs du? When do you work? Ech schaffen um 8h00 bis 17h00. Ech schaffe(n) vun 8h00 bis 17h00. I work from 8 am to 5 pm. Before the time use either the following prepositions: Um (at), géint (around), vun … bis (from … to), tëscht …. an (between … and), no (after), virun (before). Duerno der Aarbecht fueren ech heem. No der Aarbecht fueren ech heem. After work I drive home. Use: no der + feminine noun: no der Aarbecht, no der Vakanz …. Ech wunnen nach mat mengen Elteren. Ech wunnen nach bei mengen Elteren. I still live with my parents. When stating that someone is at a place or staying with someone, use the preposition BEI. Example: Sonndes iessen ech ëmmer bei menger Mamm. Mir fueren im / den August an d’Vakanz. Mir fueren am August an d’Vakanz. We go in August on holidays. Always use am + month and + season: Am Januar, am Wanter, am Hierscht …..
Ech sinn ëmmer zur Zäit am Aarbecht. Ech sinn ëmmer zur Zäit op der Aarbecht. I’m always on time at work. Always use op + Aarbecht. Ech sinn op der Aarbecht. Ech fueren mam Bus op d’Aarbecht. If you liked this lesson, consider taking my online course Lëtzebuergesch am Alldag: Lauschter a Schwätz. 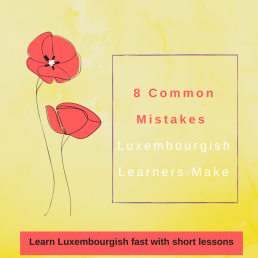 With this course you will learn spoken Luxembourgish, practice your listening, improve your vocabulary and pronunciation and more. This course gives you the opportunity to learn phrases that native speakers us in day-to-day life. This course includes 12 lessons to listen, read and a worksheet for each lesson. 2) Sign up to get your free weekly lesson every Sunday!